This is one book in a series of time traveling adventures taken by six-year-old Taki and his eight-year-old sister, Toula. These children live on the island of Crete. One day, while playing with a chest of old clothes, they discover a pair of unusual shoes. Each of the children puts on one shoe. Suddenly, they are transported to ancient Greece, where they are astonished to find a bull and a man crying. Even though they are frightened, the siblings appease the bull. They discover Hercules who is discouraged from completing the twelve labors with which he has been tasked. 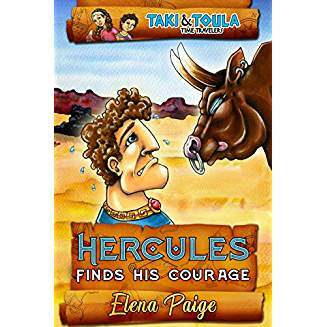 The book is a nice way to introduce a bit of Greek mythology and history to early readers. Illustrations are cartoon-like and simple, but they do the job of portraying the action of the plot. Coupled with large and easy to read font, it makes the book attractive to the beginning and reluctant readers. Recommended especially for readers in the six to eight age range. If you enjoyed reading this page, please subscribe by clicking on the word Follow or by hitting the orange RSS FEED button in the upper right-hand corner of this page. This series looks fun! Thanks for sharing at Booknificent Thursday on Mommynificent.com!